Besides being a great source of protein, beans are naturally low in fat, high in fiber, and rich in vitamins and minerals. Most beans contain only 2 percent to 3 percent fat and no cholesterol. They even help lower your cholesterol because they are so rich in fiber. Most beans contain 20 percent protein and are high in complex carbohydrates. In addition, they are rich in B vitamins and iron. 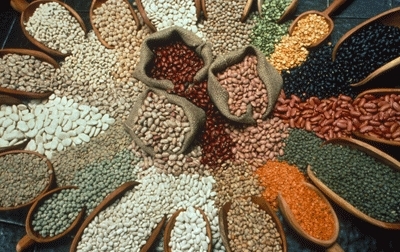 To save money at the grocery store, try eating beans and legumes once or twice a week. Cook your own beans instead of using canned and save even more. If you cook up a big batch, freeze some for use in future recipes. Delicious bean recipes can contain as little as four ingredients. Add all ingredients and heat and serve. For added flavor you can add chopped onions and peppers. Heat salsa and beans in a pan over medium heat until it comes to a boil. Crack an egg in a bowl and add one at a time. Cover and cook until eggs are firm -- about 6 minutes. Uncover and sprinkle with cheese. Cover until the cheese melts. Serve with rice and tortillas. Add to a pot, cover with water and cook until lentils are done. Remove the cooked turkey leg from the pot and remove the meat. Chop the meat in bite size pieces and add back to the pot. Season to taste with salt and pepper before serving. This recipe can be cooked in a crock pot. Combine sugar and milk in kettle then boil 5 minutes stirring constantly. Add remaining ingredients and stir until marshmallows melt then pour into buttered pan. Cool and cut into squares.